Designed for simplicity with users in mind. PDFelement scores top G2 Crowd marks for ease-of-use, customer support and user satisfaction in 2018. PDFelement delivers 100% compliance to PDF standards, plus simple and easy-to-use features at a fraction of the price. Take control and save with our Transactional Licensing Program (TLP). There are no membership requirements and no contracts to sign. Standardized solution on both Windows and Mac enables more end-users with PDF capabilities. Cost-effective pricing delivers faster ROI and reduces your total cost of ownership by 60%. Perpetual licensing is the ideal fit for businesses with finite software budgets seeking to streamline their document workflows. Get continued access to life-time product updates and customer support without any audits and contractual renewal processes. 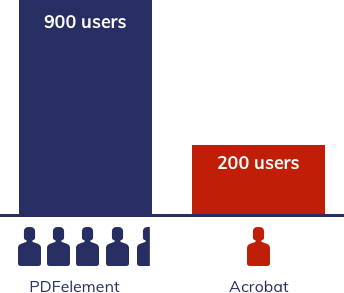 Customers can deploy 900 users with PDFelement for the same price as 200 Acrobat licenses. Learn how PDFelement can help transform your business! Create industry-standard PDF files that are fully compliant with all PDF viewers on virtually any device. Get a smarter, faster editing experience similar to Microsoft ® Word ® without losing fonts and formatting. Process thousands of files with robust data extractiontechnology and batch processing. Dramatically increase document security and streamline business workflows. We provide every feature you'll require to positively impact each department of your organization. How does PDFelement stack up against Adobe Acrobat? Find out more with our data sheet. Learn about system requirements, deployment options, release notes, user guides, and more.